Some of the Phillies additions this off season have been no doubt puzzling – while much has been written lately about Delmon Young, it seems to have been forgotten that Michael Young posted the lowest fWAR (as defined here) among player eligible for the batting title last year (-1.4). Delmon Young was twice as valuable (-0.7) as Michael but his triple-slash of .267/.296/.411 with a 3.3% BB-rate leaves a lot to be desired. There is no good way to sort this out other than by hand so I capped my research at the previous ten years: the 2013 Phillies will be the only team in the last ten years to have either signed or traded for two players who finished the previous season qualified for the batting title and contributed negative value, in this case, WAR, to their previous team. And there is reason for optimism at Citizen’s Bank Park. Or not. Whatever the case, it does feel particularly weird to be relieved that the Phillies’ projected starting right fielder may not be ready for Opening Day. And trying to do the math to convert what Michael Young’s WAR would be with 2012’s triple-slash at third base instead of the first base he played last season make me feel like I’m a casino junkie looking to scrounge up change for that one last bet that will finally put me in the win column. – Four teams in the last ten years have had two batting-title eligible players post negative fWAR. Three teams did not make the playoffs: 2012 Seattle Mariners (finished fourth in AL West), 2011 Chicago White Sox (finished third in AL Central) and 2008 Kansas City Royals (finished fourth in AL Central). One team made it all the way to the World Series: 2012 Detroit Tigers. – The 2003 Detroit Tigers had three eligible players post negative WAR totals (Bobby Higginson -0.1, Alex Sanchez -0.3, and Ramon Santiago -1.2). They finished 43-119, setting an American League record for losses and coming one loss away from tying the 1962 New York Mets for most losses by any team in either league. – In 2004, there were only three players in the Majors who posted negative WAR totals and qualified for the batting title. One of them was surprisingly Edgar Martinez. – The Phillies now have on their roster two players who have had the lowest WAR in all of baseball at least once in the last four seasons: Michael Young in 2012 and Betancourt in 2009. And remember: Michael Young was traded for something of value directly after his feat and Betancourt was traded for something of value during his run at history. 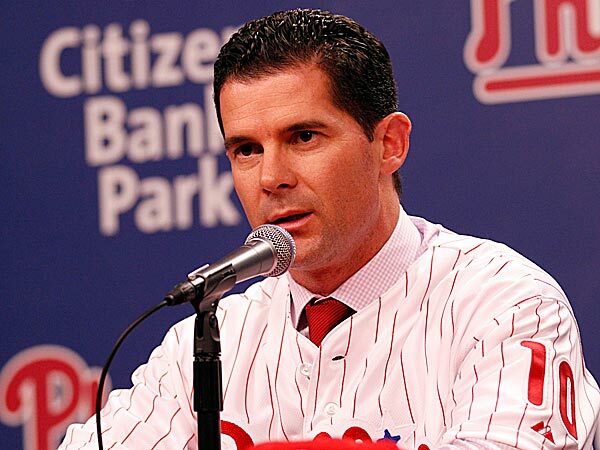 So, in conclusion, the Phillies’ pair of acquisitions (Delmon and Michael Young) is unprecedented in recent history. No team in the last ten years has duplicated that feat. Should the Youngs play to that same level in 2013, it will make them only the sixth team in the last eleven seasons to have a pair of players qualify for the batting title and be among the worst values to their club. What kind of finish would that mean for the Phillies? If recent history is any indication, they could either go the route of the 2003 Tigers, which is very unlikely, the 2012 Tigers, probably equally unlikely, or finish around .500 like the 2011 Chicago White Sox, which, in my opinion, is very likely.